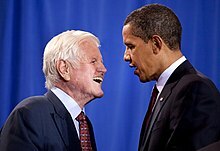 President Obama said that Kennedy's death marked the "passing of an extraordinary leader" and that he and First Lady Michelle Obama were "heartbroken" to learn of his passing, while Vice President Biden said "today we lost a truly remarkable man," and that Kennedy "changed the circumstances of tens of millions of Americans". 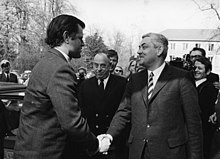 Mitt Romney, former Massachusetts Governor and Kennedy's opponent in the 1994 senate race, called Kennedy "the kind of man you could like even if he was your adversary" and former First Lady Nancy Reagan said she was "terribly saddened". She went on, "Given our political differences, people are sometimes surprised how close Ronnie and I have been to the Kennedy family. ... I will miss him." 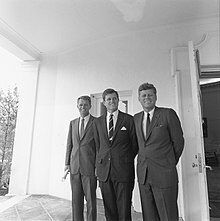 Senator Robert Byrd of West Virginia, the President pro tempore of the Senate, issued a statement on Kennedy's death in which he said "My heart and soul weeps at the loss of my best friend in the Senate, my beloved friend, Ted Kennedy." (Byrd had broken down on the Senate floor and cried uncontrollably when Kennedy's cancer diagnosis was made public the previous year.) Upon his death, his sister Jean is the only one still living of the nine Kennedy siblings. The funeral service also drew celebrities and other notables from outside politics from Boston, Washington, and across the United States, including journalists Bob Woodward, Tom Brokaw and Gwen Ifill. singers Tony Bennett and Plácido Domingo, cellist Yo-Yo Ma, actors Jack Nicholson, Lauren Bacall, and Brian Stokes Mitchell. presidents and chancellors of Boston-area colleges and universities including Harvard University President Drew G. Faust and University of Massachusetts President Jack M. Wilson, and sports figures including Boston Celtics legend Bill Russell and the top management of the Red Sox. 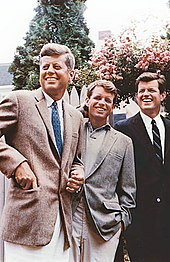 Kennedy's remains were returned to Washington, D.C. and laid to rest at Arlington National Cemetery, near the graves of his assassinated brothers. 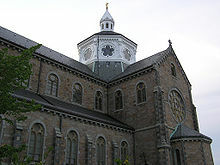 Former Cardinal and Washington D.C. Archbishop Theodore McCarrick presided over his burial service, which attended by Biden, Kennedy's widow Vicki, and other members of the Kennedy family. 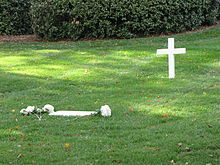 Kennedy's grave marker is identical to his brother Robert's: a white oak cross and a white marble foot marker bearing his full name, year of birth, and death. 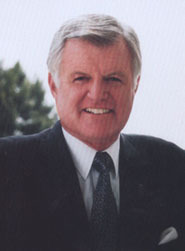 A special election was scheduled for January 19, 2010, for the U.S. Senate seat from Massachusetts left vacant by Kennedy's death. 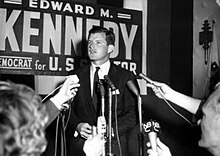 Shortly before his death, Kennedy had written to Democratic Governor of Massachusetts Deval Patrick and the Massachusetts legislature to change state law to allow an appointee to fill a U.S. Senate vacancy, for a term expiring upon the special election. 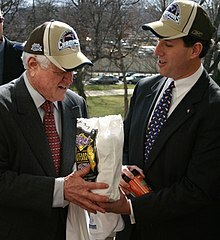 (Kennedy had been instrumental in the prior 2004 alteration of this law to prevent Governor Mitt Romney from appointing a Republican senator should John Kerry's presidential campaign succeed.) 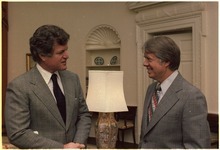 The law was amended, and on September 24, 2009, Paul G. Kirk, former Democratic National Committee chairman and former aide to Kennedy, was appointed to occupy the Senate seat until the completion of the special election. Kirk announced that he would not be a candidate in the special election. In that election, Republican State Senator Scott Brown won the seat in a stunning upset, ending Democratic control of it going back to 1953. Political scientists gauge ideology in part by comparing the annual ratings by the Americans for Democratic Action (ADA) with the ratings by the American Conservative Union (ACU). 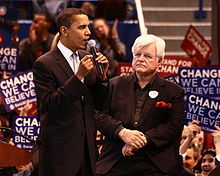 Kennedy had a lifetime liberal 90 percent score from the ADA through 2004, while the ACU awarded Kennedy a lifetime conservative rating of 2 percent through 2008. 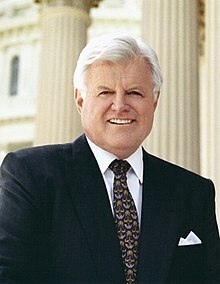 Using another metric, Kennedy had a lifetime average liberal score of 88.7 percent, according to a National Journal analysis that places him ideologically as the third-most liberal senator of all those in office in 2009. 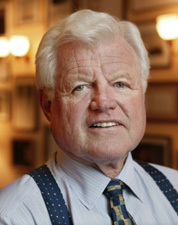 A 2004 analysis by political scientists Joshua D. Clinton of Princeton University and Simon Jackman and Doug Rivers of Stanford University examined some of the difficulties in making this kind of analysis, and found Kennedy likely to be the 8th-to-15th-most liberal Senator during the 108th Congress. The Almanac of American Politics rates congressional votes as liberal or conservative on the political spectrum, in three policy areas: economic, social, and foreign. 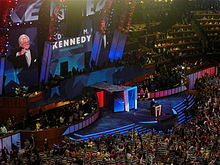 For 2005–2006, Kennedy's average ratings were as follows: the economic rating was 91 percent liberal and 0 percent conservative, the social rating was 89 percent liberal and 5 percent conservative, and the foreign rating was 96 percent liberal and 0 percent conservative. 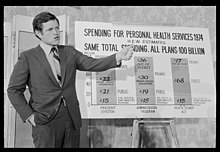 This page is based on the Wikipedia article Ted Kennedy; it is used under the Creative Commons Attribution-ShareAlike 3.0 Unported License (CC-BY-SA). You may redistribute it, verbatim or modified, providing that you comply with the terms of the CC-BY-SA.